This easy-to-use Wine Saver pump set removes excess air from open bottles for a virtually airtight seal. The vacuum action helps preserve the subtleties and flavor characteristics of the wine as it sits. Simply press one of the included rubber caps onto an open bottle, press the pump opening over the cap head, and then draw out the pump plunger. 100% Satisfaction Guarantee - If it doesn't live up to your high standards then we will refund your money back no questions asked! Note: Do not rinse the cap with hot water to prevent distortion. Will create a strong airtight and preserve the bouquet and aromas of your wine bottles after opening, the natural way. 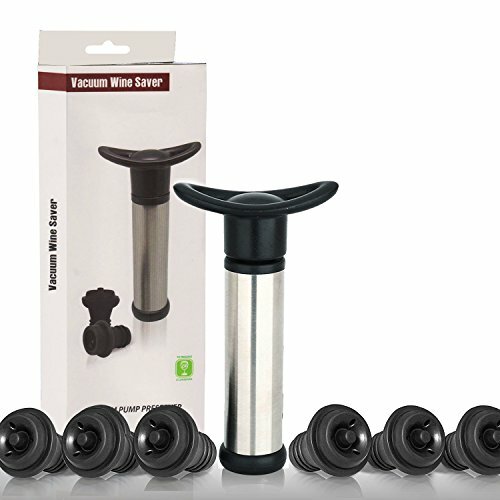 Six premium stoppers will provide you with a faultless sealing on all your bottles of wine (except sparkling) and thus prevent the oxidation process responsible for the deterioration of your favourite wine. Once resealed with your Wine Pump, you will also be able to store them vertically - but also horizontally - without worrying about possible leaks. Its robust finish will tolerate years of intensive usage and its elegant design will make of him an accessory you will not want to hide away. ★ 100% SATISFACTION WARRANTY★ If you are not satisfied with your item, simply let us know and get a FULL refund on your purchase immediately, no questions asked. We trust the quality of our products, and we know you will too. If you have any questions about this product by ANGESHEN, contact us by completing and submitting the form below. If you are looking for a specif part number, please include it with your message.